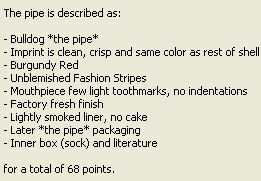 The value of pipe #768 is 68 points. Susan Brancamp (sbrancamp0rmf) offered this pipe on eBay describing it as "new" and "never out of the box." Unfortunately, it had in fact been out of its box and smoked several times. After some courteous and understanding correspondence about the issues with the pipe, the seller did the right thing and refunded a substantial proportion of the purchase price. It's nice to deal with honorable folks! Except for its packaging (which I have several versions of) the pipe itself is no improvement for my collection. It can be found on the Pipes for Sale or Trade page. It didn't last long! Larry Arnold found it within a few days and added it to his collection.